Edward Blum, founder of Students for Fair Admissions (SFFA), speaks to reporters at a rally in Boston on October 14, one day ahead of the start of the trial. In a packed Boston courtroom Monday, Harvard and the anti-affirmative-action group Students for Fair Admissions (SFFA) presented arguments in the first day of trial of a four-year-old civil-rights lawsuit charging that the College’s admissions office discriminates against Asian-American students. Top University administrators including former president Drew Faust, former dean of the Faculty of Arts and Sciences Mike Smith, College dean Rakesh Khurana, and director of admissions Marlyn McGrath will all testify in the case. This summer, the U.S. Department of Justice withdrew Obama administration guidelines on the use of race in college admissions, and filed a statement of support for SFFA in the case. All the other schools in the Ivy League, plus nine other private universities, have filed a joint friend-of-the-court brief this summer defending the use of race in admissions. The trial is expected to run through November, and U.S. District Judge Allison Burroughs will likely rule several months later. In his opening statement, Adam Mortara, an attorney for SFFA, told Judge Burroughs that Harvard’s practice of assigning applicants subjective “personal” ratings results in discrimination against Asian Americans. “The ‘personal’ rating is crucial to admission to Harvard,” Mortara said, citing “undisputed evidence” that “Asian-American applicants to Harvard receive substantially lower personal ratings than white applicants.” He argued that despite their importance to the admissions process, the “personal” scores are ill defined and invite implicit bias and racial discrimination. An exhibit presented by Mortara showed that the score is assessed on a four-point scale: “1.Outstanding 2.Very Strong 3.Generally positive 4.Bland or somewhat negative or immature.” Mortara also said that Asian-American applicants on average perform better than whites on other measures used by the admissions office—academic and extracurricular. Burroughs has already dismissed SFFA’s claim that race should not be a factor in college admissions, deferring to Supreme Court precedent on the issue; instead, she will consider whether Harvard’s admissions process discriminates against Asian Americans. Nevertheless, the legality of affirmative action may be considered by a higher court if the case is later appealed, as it almost certainly will be. Edward Blum, the founder and president of SFFA, may anticipate a favorable audience among the now majority-conservative Supreme Court, which he hopes will rule the use of race in admissions unconstitutional. Blum, a well-known conservative political activist and opponent of affirmative action, sponsored Shelby County v. Holder, the Supreme Court case that invalidated Article V of the Voting Rights Act. He also led the much-followed 2016 case Fisher v. University of Texas, in which Abigail Fisher, a white woman who was denied admission to the school, alleged the institution discriminated against her on the basis of race. In that case, the Supreme Court upheld the University of Texas’s policies, ruling that college affirmative-action programs must be tailored narrowly and show that they accomplish a specific goal, and ruling also that colleges must prove that race-based admissions policies are the only way to meet diversity goals. Mortara also condemned the strong preferences given to children of Harvard graduates and faculty and staff members, donors, and recruited athletes, which also advantage white students relative to Asian Americans. “Harvard steadfastly refuses to even contemplate giving up legacy and donor preferences,” he said. Lee also argued that SFFA’s claims of discrimination were unsupported, that Harvard’s admissions process has been upheld as exemplary by the Supreme Court (by using race only as a “plus” factor, and evaluating each applicant as an individual), and that diversity is central to the University’s educational mission. Applicants’ “personal” ratings, he said, were determined by information conveyed to admissions officers through sources like teacher and guidance-counselor recommendations. 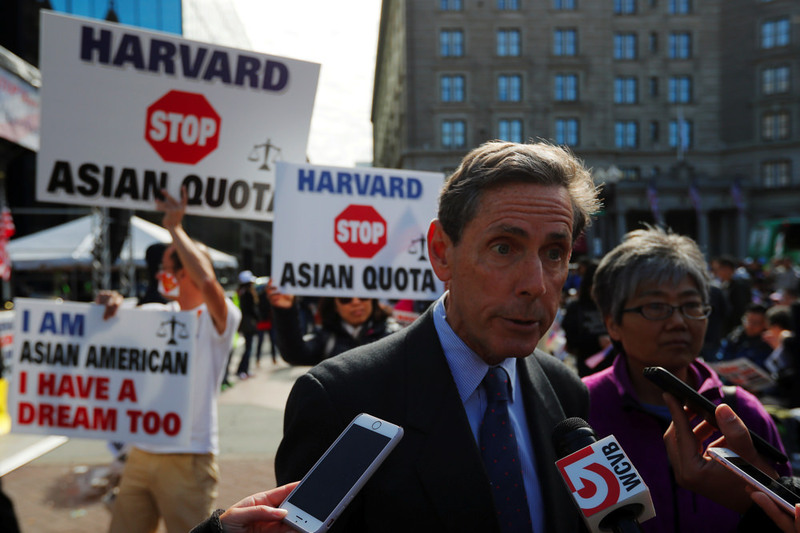 After nearly four years of litigation, Lee said, and the release of data on more than 200,000 applicants to Harvard over a six-year period, SFFA can’t prove that Harvard discriminates against Asian-American applicants. He stressed that race is never the sole or determining factor in an applicant’s admissions decision: “Instead, the evidence will confirm that, as permitted by the Supreme Court, race is considered as one factor among many in the Harvard admissions process; that when it is considered, it is considered flexibly; and that it is always used as a ‘plus’ factor.” A candidate’s race is never considered a negative in admissions, he later said. Harvard’s admissions process “was lauded by Supreme Court in Bakke as an ‘illuminating example,’” Lee said, citing Regents of the University of California v. Bakke, the 1978 case that upheld affirmative action, ruling that race may be used as one factor in college admissions, but not as part of a racial-quota system. SFFA’s and Harvard’s arguments rely on conflicting testimony from two expert witnesses: for SFFA, Peter Arcidiacono, a Duke economist who analyzed Harvard’s admissions data and concluded that its process discriminates against Asian Americans through its use of a personality score for applicants; and for Harvard, David Card, a Berkeley economist who concluded that the data show no evidence of discrimination. In the afternoon, William Fitzsimmons was cross-examined by SFFA lawyer John Hughes—an exchange that, at times, turned combative. Hughes first questioned Fitzsimmons about the use of PSAT scores to recruit high-achieving high-school students to apply to Harvard—a practice that the admissions office considers important to shaping the student body. Nearly 100,000 letters, for example, were sent to high-school students on the basis of PSAT scores for recruitment to the classes of 2017 and 2018. Documents from the admissions office indicated that white students from states in so-called sparse country—encompassing 20 states across the nation—received recruitment letters if they scored at least 1310 on the PSAT. Asian Americans anywhere in the country needed to score at least 1350 for women, or 1380 for men, to receive recruitment letters. Hughes also tried to show that Harvard’s own practices contradict its criticism of SFFA’s statistical analysis. Harvard’s website argues that SFFA’s case “hinges on a statistical model that deliberately ignores essential factors such as personal essay or teacher recommendations, and omits entire swaths of the applicant pool (such as recruited athletes or applicants whose parents attended Harvard) to achieve a deliberate or pre-assumed outcome.” But, Hughes asked, isn’t that the same thing Harvard does? The University’s internal statistics track both overall admission rates, and “non-legacy, non-athlete” (NLNA) admission rates, Fitzsimmons acknowledged, because of speculation over why admission rates for white and Asian-American students were so different. In 2012, after a student filed a federal civil-rights complaint alleging that Harvard discriminated against Asian Americans, the University wrote in a letter to the Office for Civil Rights that if admissions-rates data were limited to NLNA applicants, the admit rates for Asian Americans and whites would be far closer. Examinations of Fitzsimmons, and other witnesses in the case, resumed today.